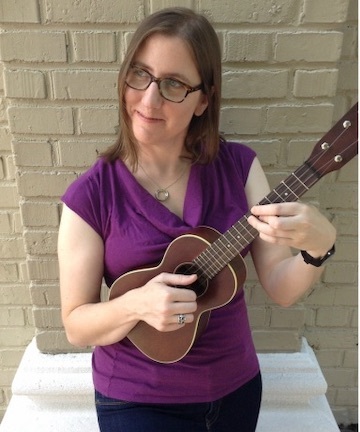 Rachel Manke has been playing the ukulele for 20 years. It's the passion that has fueled adventure and friendships in her life. She is a skilled player in a vaudeville vein who has taken flourish and technique from that stage into various genres. She has appeared on stages that range from the Ashokan Uke Fest and Strummin' Man to Garrison Keillor’s A Prairie Home Companion. A little bit country, a little bit everything else, a whole lot of funny, and a touch of sentiment. Rachel started in the late 90's on a $25 Hilo soprano and came to the uke world via the founders of the Ukulele Hall of Fame Museum. She first studied with Joel Eckhaus, directly learning from the well known student of the famed Roy Smeck. Ever since, she has continued to learn and perform, and is now a respected teacher as well. She has a penchant for Tin Pan Alley, old-time music, and is a master of the old-school uke chord solo flourish.